Tasks on the iPad, it’s all about the sync! 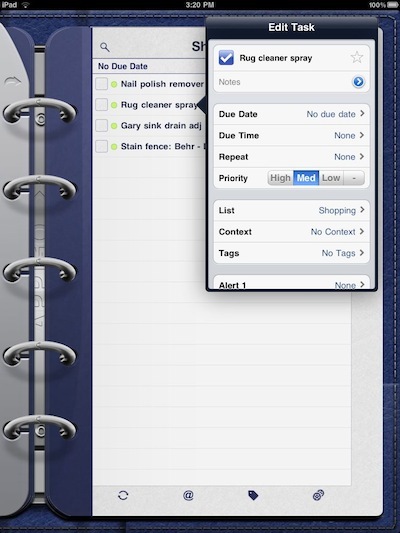 We have mentioned many options for using your iPad to track and manage your Task lists. “ToDo” was one that we enjoyed due to it’s nice user experience and it’s ability to sync to other devices without connecting up to the desktop computer. The many versions of Todo; iPad, iPhone and Mac desktop all in sync means we could keep up on what we needed to do no mater where we were. ToDo for the iPad has now expanded it’s list of sync options with the addition of DropBox. Previously you would choose Toodledo or the Appigo ToDo service, with the new DropBox option you have a free way to keep many devices all up-to-date. DropBox is of course a free cloud storage service so while the other two options allow for online editing of the ToDo list through a Web site, DropBox is only used for transfer and storage. Two other ‘sync’ features added in the update to ToDo is the ability to set your sync to happen automatically upon exit of the app and ‘background sync’ so your lists are always current even when your working.